Ladies and gentlemen, what you see below you is actually not a photograph of actress Gal Gadot striking an action pose as Wonder Woman, believe it or not. 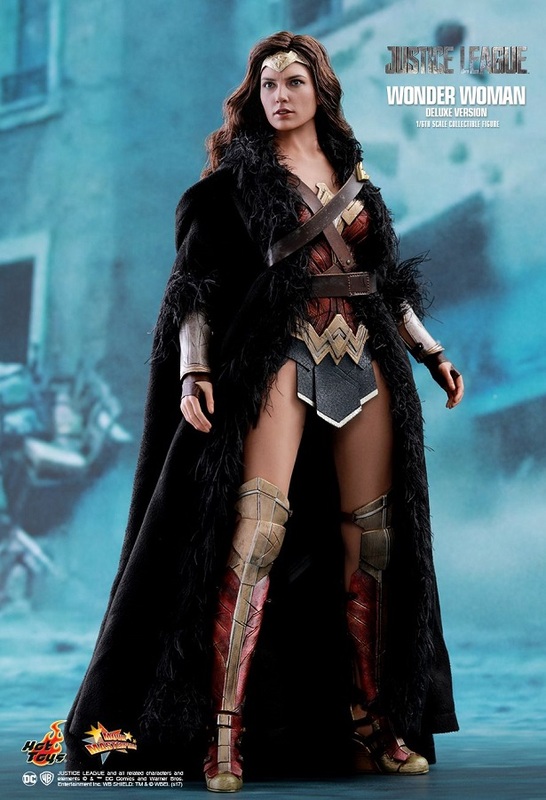 It is actually the latest Hot Toys figure with a stunning, real-life likeness of the Justice League actress in all her Amazon warrior glory. The 1/6th scale figure joins previously announced Justice League Hot Toys like the Flash, Batman, and Aquaman. This is only the latest Hot Toys Wonder Woman figure, as the first was released last year to coincide with Batman v Superman, but we think this one is superior to even that amazing figure. The all-new Justice League Wonder Woman figure also comes with several different weapons and accessories, including Diana's sword, her shield (which comes weathered), two pairs of Wonder Woman’s Amazonian bracers, her Lasso of Truth, and a specially designed Justice League-themed figure stand, to match the rest of her League teammates. Also included is a hooded robe, like the one she wears in her solo film, her cross-body belt, and the Mother Box that was property of the Amazons. The robe and the Mother Box are exclusive to the Deluxe Figure. Hot Toys Justice League Wonder Woman figure will be available to pre-order on the Sideshow Collectibles website, in both standard and deluxe versions. The full list of features is available here, and you can check out photos of the figure in the gallery below. What do you think of the latest Hot Toys work of art? Be sure to let us know in the comments below. Lasso more Wonder Woman stories! How Wonder Woman should have ended. A subtle but perfect Wonder Woman jacket. Was it okay for Wonder Woman to retcon Batman v Superman?